The senior center chose the Huskies after recently narrowing down his choices to Saint Mary’s and the UW. If Mike Hopkins and the Washington Huskies basketball program want to keep their commitment to the 2-3 zone, why not add a 7-footer to the squad? Actually, 7-feet is selling Richland High School’s Riley Sorn short. 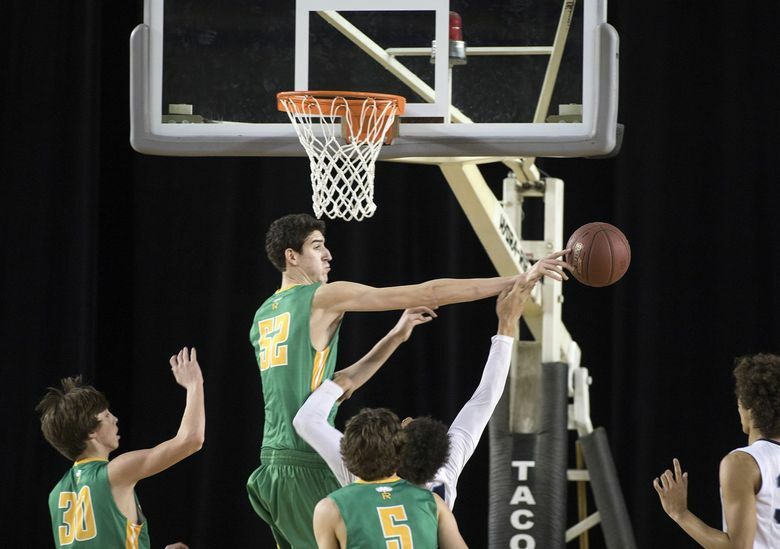 Sorn, a senior who made his verbal commitment to the University of Washington on Monday morning, is 7 foot 4. Sorn averaged 16.6 points, 8.4 rebounds and four blocks per game for the Bombers this season. Richland finished fifth in the Class 4A state tournament after losing to eventual state champion Gonzaga Prep in the semifinals. Sorn is the Huskies’ fifth commit in the class, and the first in-state commit in Hopkins’ 2018 class. He’s ranked as a three-star prospect by 247sports.com and will by most accounts, be a bit of a project for the Huskies. He’ll need to add some size to his frame, continue to work on his midrange game and his footwork. Shane Prante shot a 5-under 67 to take a stroke lead after the first round of the Muckleshoot Casino Washington Open Invitational at Meridian Valley Country Club in Kent. Prante, The Home Course pro, started on the back nine and had five birdies (and a bogey). He birdied his final hole to get to 5-under. Three golfers were at 4 under. • Washington’s Carl Yuan was named to the Pac-12 all-academic second team. Yuan is a communications major with a 3.46 GPA. Frank Garber,Julianne Alvarez, Wenyung Keh and Karen Miyamoto were all named honorable mention. • Joial Griffith was named women’s coach at Whitworth University. She was an assistant coach at Williams College in Williamstown, Mass. She replaces Helen Higgs, who was coach of the Pirates for 24 years. • Aubrey Shelton, 35, was named men’s coach at the University of Puget Sound. He was a successful coach at Lincoln High in Tacoma.